Relaxed and welcoming, the Miyama restaurant has been popular with Japanese businessmen for 25 years and is best known for its highly authentic cooking & exemplary service. Close to Green Park station this restaurant offers a comfortable and inviting atmosphere in a lovely modern dinning room. Miyama gives you freshness and quality and proves that taste and simplicity is far better than trend. Miyama pays tribute to what Japanese food should be, simple, elegant yet able to incorporate complex subtle flavours. Waitresses are dressed in Kimono (traditional Japanese dress), are very friendly and attentive, and ensure that you receive the top level service that can be expected from a high quality restaurant such as Miyama. 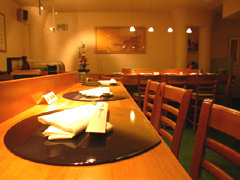 The restaurant provides you with a guide as to what wine or Japanese drink is best to accompany your sushi. There is also a takeaway and delivery service within the local area. Here an exciting menu lists a huge range of dishes from every corner of Japan. The chef has the uncanny ability to source the freshest seafood and even has certain slightly more uncommon items. The teriyaki dishes are highly recommended and the sushi is delicious. Accompanying the fresh food is a long list of Japanese drinks such as Sake and original Japanese cocktails. If this is not enough for a cultural evening, the green-tea Mousse or Coffee Zenzai makes a deliciously different dessert.